110 WILLDEY, G. / TERASSON, H. A new & exact map of Germany corrected according to the newest observatioons. ( Londres, ca.1717) Limites en col. ancien. 2 feuilles jointes. Larges fentes le long des plis brunis. Belle impression. - Two joined sheets. Discolouration along folds, separating. A good and dark impression. 635 x 945 mm. � Carte d'Allemagne d'apr�s Senex, grav�e par Terasson et publi�e par Willdey. 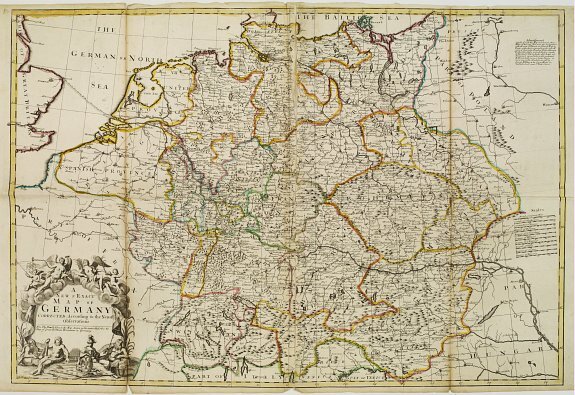 - Map of Germany engraved by H. Terasson, who was a daughtsman and engraver active in London. Published in 1717 by George Willdey. Plate originally published by Senex. Willdey seems to have been a wheeler-dealer, whose shop was stocked with all manner of goods and commodities, many of which are listed and illustrated on some of his maps, including spectacles, scientific instruments, cutlery, toys, snuff, and so on. In the "Advertisement" : "Sold for 9.d each this Map and Several other Maps of this size. You may have also be furnished with all sorts of French and Dutch Maps & Prints at the most reasonable prises with all sorts of Spectacles, Readings-Glasses, Telescopes, Perspective Glasses and whatever is curious in this kind�"